I sometimes I call myself a fabric snob. 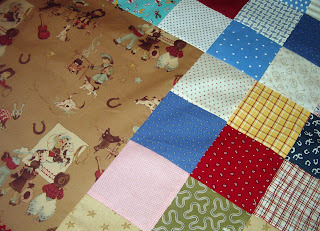 I don't like buying fabric from all one line to make a quilt and I like to have vintage fabric in every project I make. I don't want my quilts looking like everyone else's quilts, most of the time. I like vintage fabric so much that my fantasy is that I could time travel back to fabric shopping with my mom in the 60s and buy fabric that I remember or dream of having. I guess that is one reason why I like feedsack fabric so much. Not only is it vintage but there's a story behind it. Feedsacks were made in fabric to package flour, sugar or other commodoties. Women depended upon feedsacks to make things for their home and clothes for their families many years ago. Darlene Zimmerman wrote a lovely book called Chicken Linen all about feedsacks. 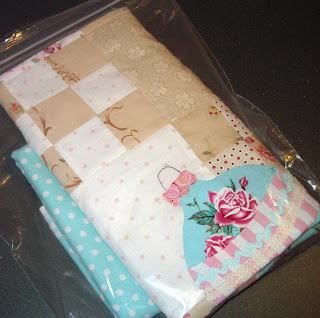 I have a small collection of feedsacks and have made several quilts mainly using feedsacks. 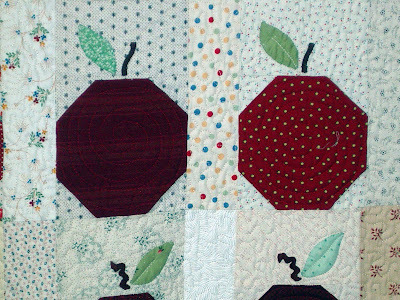 Even the border fabric in this quilt is vintage fabric. For Christmas Natalie gave me several feedsacks she got at an antique store in Salt Lake. 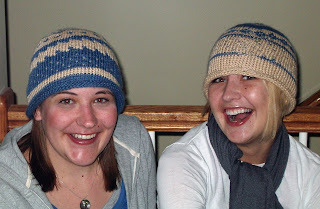 They are cheerful and bright and even still have the stitching lines in them. I think the are so beautiful. I hate to even cut them because they are in such pristine shape. 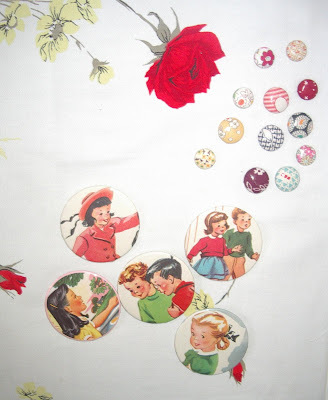 I also love reproduction novelty fabric. I can't post the pictures from their website but Superbuzzy has some new ones that I am really wanting. One of my goals for this year was to use my stash more and buy less fabric. One blog I saw has a count down to how many days the blogger has gone without bringing new fabric into her home and is on a 2008 fabric diet. So needed. My compromise is to tell myself to only buy a fat quarter or the smallest amount they sell on line when I simply have to have something. I'm pretty sure that is reasonable. My sister Michelle told me she had a surprise coming for me in the mail. I love getting surprises. And I love giving surprises. She told me to save a spot on my sewing room shelves. Today in the mail I got the most darling gift. 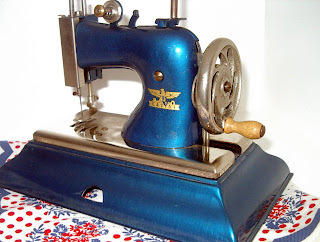 It is a toy sewing machine - VINTAGE! Its from the 40s or 50s. I absolutely love it. It is so me. Michelle said there was an article and pictures about vintage toy sewing machines in an issue of Mary Englebreit's magazine. She looked for one to give me after reading the article. I had to look the article up on line and look at all the darling versions of toy sewing machines just now. I couldn't wait to put my toy machine in the saved spot on my shelf and take a photo. It is amazing. Michelle sent a sweet and loving card that I will keep and read when I need a pick-me-up. It was almost as nice as the little sewing machine. 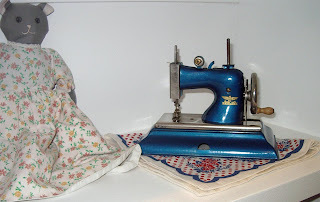 She reminded me that we had a little toy sewing machine when we were children. I had almost forgotten that! This cute blue machine looks so great on the shelf. It has a little circular wheel on the side you can turn to make the needle go up and down. I can't wait to explore it to see how it works. I will love it forever. It will make me very happy when I look at it everyday. Its so sweet. Thank you Michelle!! I love it. I put it right next to a kitty doll my mother made for my daughter Whitney (that I am "keeping safe" for her). Its an upside down doll with the kitty under the skirt sleeping and wearing a bonnet. I think they look cute together. Aren't I so lucky! Don't you love it when you get things done on the weekend? 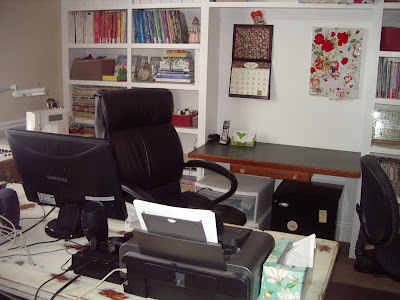 It feels so great to work in my new sewing room feel productive and have results. I love it. I am feeling pretty spoiled. First of all I was able to do finishing touches on the sewing room. I hung my bags on the wall, which is a splash of creative color and fun to have displayed. I moved this wicker chair into the room and I covered the cushion with the last piece of quilted kitchen curtains I have been recycling. I know its not the best picture staging with the light slanting in on the photo but the great sunlight in this room is fabulous to work in and I wanted to show a little slice of winter sunshine from my nice window on Saturday. Chelsey helped me hang photos on my sewing wall. The top is a great wedding day picture of my in-laws. It is darling of them and the setting plays to my love of all things vintage. Below that are pictures of my parents taken just before they met eachother. 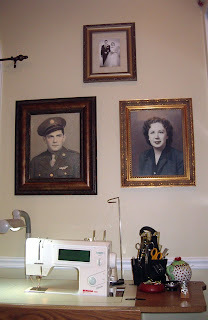 Its fun to sew with them looking down on me. Its peaceful, and when I need to, I just talk out loud to my mother. And she always listens. If that makes me crazy, then so be it. 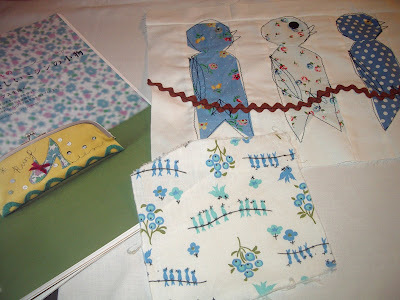 I love to sew in peace and quiet or listen to music. But sometimes I like to watch a good movie or TV during a project. 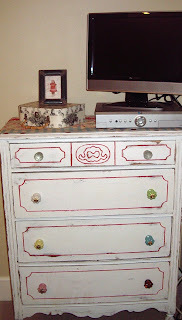 This dresser was from my childhood. My girls painted, distressed it and painted polkadots on the top for Mother's Day one year. They got the different knobs from Anthropologie. I love it. Again, its vintage, great storage, and puts the TV at a perfect angle and height. 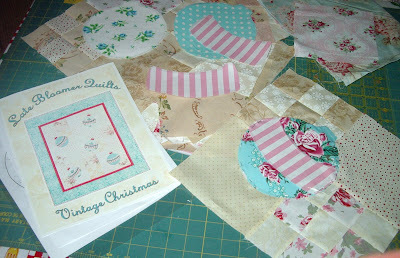 I finished putting together Vintage Christmas by Elizabeth. I loved working on it. It was a really fun project. I used my scraps and fabric from Paris Bebe. Of course mine is slightly different than Elizabeth's. 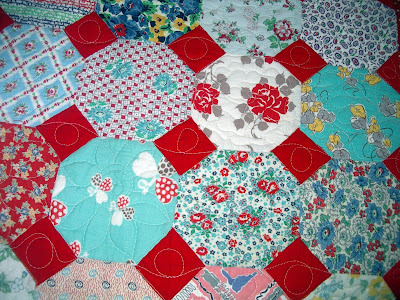 But that is some of the fun part of quilting, putting your own spin on others ideas. One of the Christmas balls is made from a scrap of feedsack fabric and another is from a piece of fabric Elizabeth sent to me. Thanks again, Elizabeth. 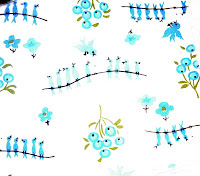 I was going to machine quilt it myself but its such a special quilt I am going to take it to Wren Woodland (Sew Small Sitches), a local machine quilter. She does great work. 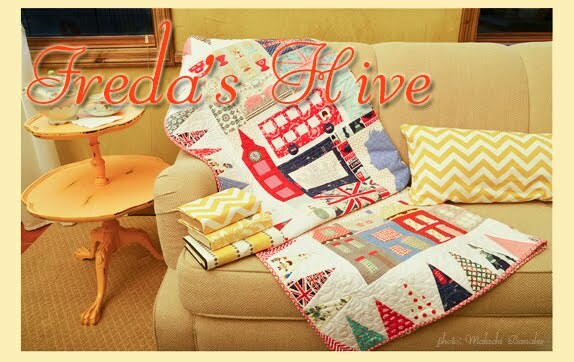 I do machine quilting on my Bernina but I limit my size of projects so most of my big or special quilts I take to a quilter. 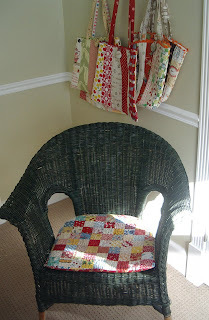 I love having a project done with the back sewn all ready and in the bag to take to the quilter. I was able to machine quilt and bind the wall hanging on the left for my niece Tricia. Her baby is due very soon and she made the counted cross stitch in the wall hanging for her baby's room. 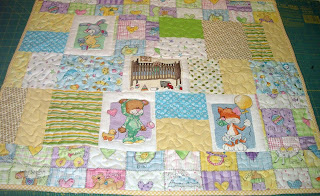 Then below I finished sewing the quilt top for her baby who will be named Rex. He is named for Tricia's dad who was kind of a cowboy and Josh, Tricia's husband, is definately a cowboy at heart. When we went to my sister Michelle's Crow Creek Ranch in Wyoming, Josh took on the roll of a regular ranch hand. So I thought they might like this cowboy baby quilt for Rex. I'll quilt and bind it this week and get both quilts off in the mail and hopefully they will arrive before the baby is born. Its their first baby. Lately, I've been on a real hat kick. My mom got me a book for my birthday, Last Minute Knitted Gifts, by Joelle Hoverson, owner of Purl Soho. 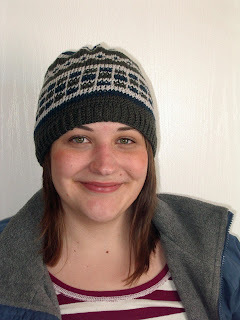 I used her hat pattern as the base for the hats that I have been making and have created my own designs and patterns using 2 and 3 different yarns. I started using machine washable yarns from Knit Picks, but morphed into also using my current favorite yarn, Gems from Louet -- a beautiful yarn that is also machine washable! 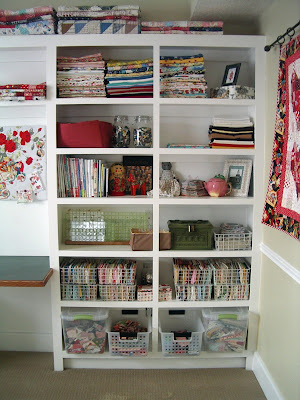 Now that I'm settled (mostly) in the sewing room I can get some of the rest of my house back in order. 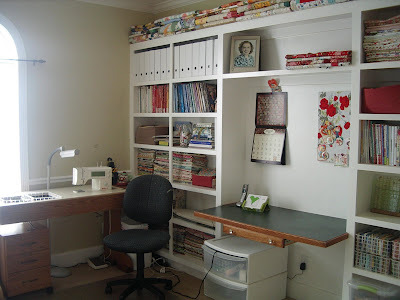 I've had to move my sewing area around in the past months to accommodate painting and remodeling. The family room is now back in order and I can look at my favorite corner of my home unobstructed. 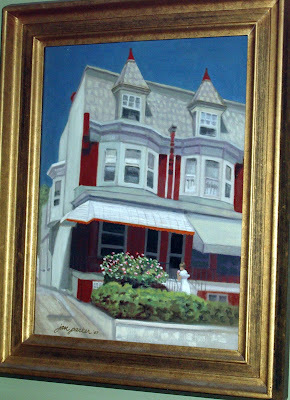 This is a painting created from several photographs of the 1890s row home where I grew up in Pennsylvania. I slept in the bedroom on the left side of the home with the bay window until my sisters grew up and moved out. Then I took over the 3rd floor bedroom pictured at the top of the home. It was a lovely home with huge mouldings and high ceilings. It isn't very special anymore and the neighborhood is quite run down. But it was a very nice home in our working class neighborhood in the 60s-70s. I loved living on Church Street. (My parents moved to Utah in the mid 70s just before I graduated from high school.) I have wonderful memories of the happy carefree childhood I experienced in our home. 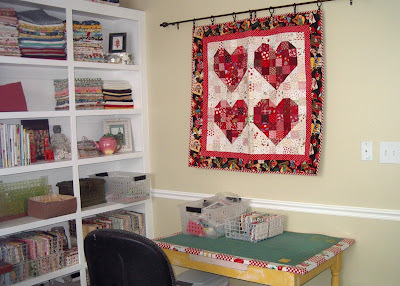 My mother was the center of our home and her sewing room was the heart. When I look at the painting I am filled with peace and fondness for all that my parents and sisters mean to me and the many blessings I have from being reared in that home. Recently my brother-in-law was able to take the painting (with the consent from the artist) and digitally reproduce it on canvas. He worked very hard on it and its difficult to tell the original from the copies. I had them mounted and framed and gave them to my sisters for Christmas. I know they will enjoy this painting as much as I do. The painting is on one side of the wall in the corner, and this quilt is on the other wall, as the 2 walls meet together. The cute little tea set is from 2 of my daughters. I don't drink tea but I do love tea sets and this one with the dots is totally "me". 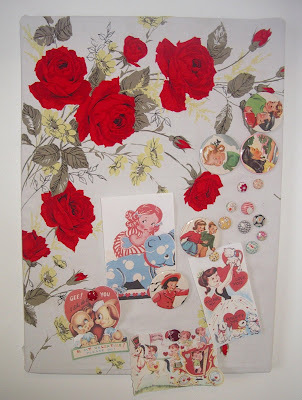 I've been really excited with the response to my free valentine flag/banner pattern. Anyone that finishes the little quilt by Valentine's Day, I will send a free pattern for my umbrella April Showers/May Flowers flag. 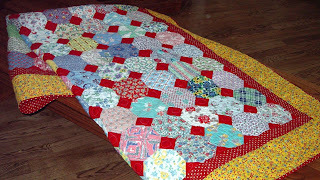 Just email me a photo of your finished valentine quilt by February 14, 2008 along with your address and I will mail you a pattern. I will send umbrella fabric for the border along with the pattern to the first person that sends me a finished picture of their valentine quilt. 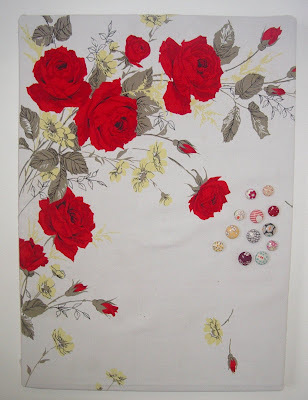 On Valentine's Day I will post pictures of finished valentine flags/banners/quilts on my blog. I have to laugh at some of the comments saying how organized I am. Really I'm only a semi-organized person. With 8 children standards have had to be relaxed in certain areas. And I don't think when they were young I could have maintained a room like this. It just wouldn't have been possible. I have to also credit my best friend Laura with organization ideas and inspiration. She's so fabulous at cleaning out and organizing and she gave me many of the good ideas I used. I have to say I'm very proud of it. I can't tell you how much help I've had from my family. The girls and Dave have worked very hard to get me into this space. I am really grateful for all their help. They are like a troop when we get together to work and accomplish so much. Many hands make light work as the saying goes. I still have pictures still to hang and some other things to move in and finish but I'd say now 90% of the room is done. And I can start work in here. YAY. It is so peaceful and nice. Having things all in their place is such a calming feeling. Also the family room is at the other end of the house. Tonight when I had a spare moment I came in here and after a few minutes my husband came and noted how quiet it is . I can still oversee the family mayhem but from a distance. They aren't little anymore and I (only) have 4 of the kids living at home right now so it makes having a separated space possible. Weekends are different we usually have many or most of them here. We had a flood last August (broken pipe) that damaged half the first floor and all of the finished basement (4 bedrooms downstairs). So we've had new remodel for basically half the house and my kitchen is just finishing being remodeled. I have the chance to start fresh in our home after 13 years of hard use by a big family. 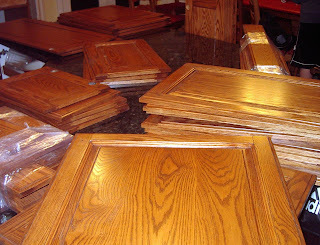 We are taking rooms not affected by the flood room by room as we can manage and updating them. Ok so here is more of the progress . . .
2. Computer and work area - check. Two of us at a time can share this room, if needed. I work from home a couple days a week so having an office space in my room is important. The desk is a distressed finish of the kitchen table my parents had in their home. 3. Cutting area- check. This is a little old kitchen table I bought at a yard sale and painted a distressed yellow. I put oilcloth on the top for a smooth surface and it fits my cutting mat perfectly. 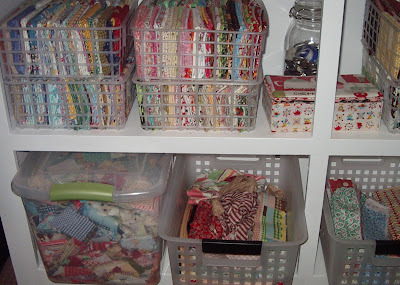 There is room enough to cut and organize before sewing. 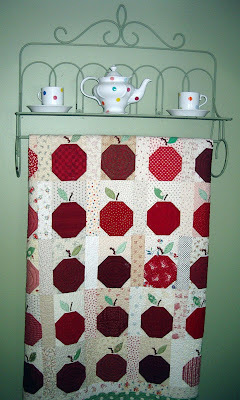 I can also clip batting on top of the quilt display rod and use it as a design wall when I need it. 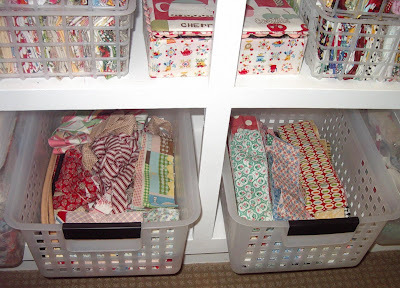 I really like the fat quarter, smaller piece grid baskets I got from The Container Store. They were very reasonably priced and I can see everything folded inside. Two rows fit perfectly. Not all of them are folded exactly the same but are in a reasonably similar size. I love seeing everything out in the open to choose from rather than digging through a large storage bin. 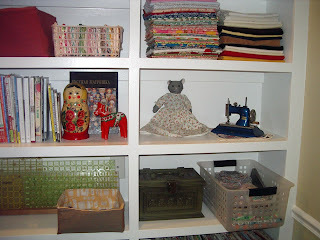 The bottom shelf by the cutting area is mostly for smaller fabric pieces. 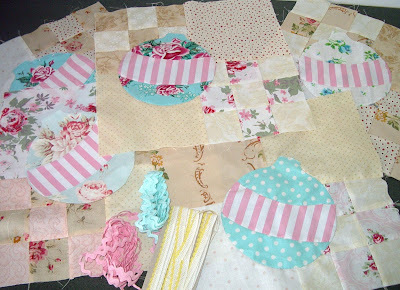 . .
and orphan blocks, projects that are cut and ready to sew, and kits I have made up to sell or use. This bin holds 2 1/2" squares that I cut as I go out of scraps. My rule is when the bin is full I either use them, stop cutting, or clear some out. It looks kind of messy but if I need a certain color I can fish through and not worry about it too much and iron them before I use them. I use a lot of 2 1/2" squares in quilts. 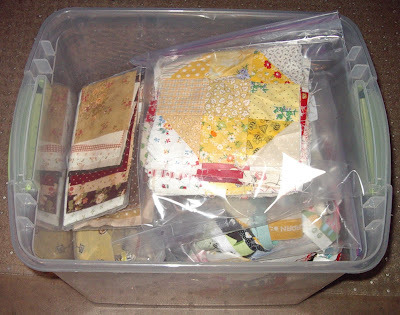 I also have groups of larger squares I keep in zip lock bags in another area. The bin on the left is for pre-cut straps for the bags I make and extra binding that is all ready to go. 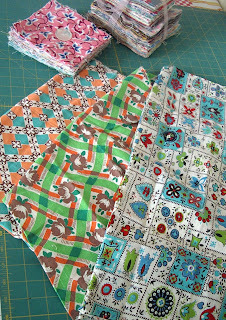 The one on the right has 2 1/2" strips for jelly roll type quilts or small inner borders. This post is really to celebrate that I got new carpet today in the new soon-to-be sewing room and living room at my home. YAY! I have been waiting and waiting for it to come in and now the real work begins setting up my machine and moving tables and things into the room. I've been filling the shelves slowly and organizing fabric but thats not even done. (You wouldn't believe how much fabric I have donated to Deseret Industries, it kills me when I think of it). But Natalie helped me whiddle the stash down to fabric I feel I will actually use. I had to put something fun on the carpet so I laid out my collection of vintage greeting cards. I love them. 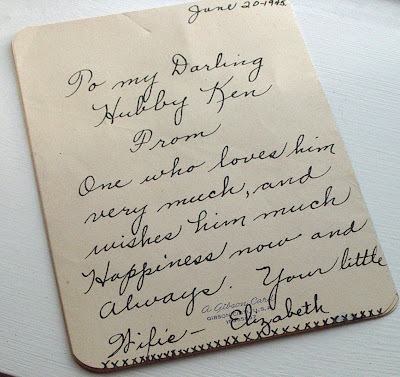 They have such happy optimistic messages inside and represent my love of all things vintage. 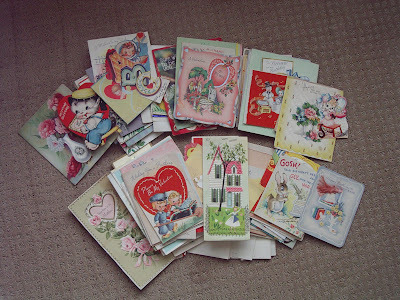 This collection of cards is from unknown people. I'm a thrower and sentimintality has come slower to me over the years. 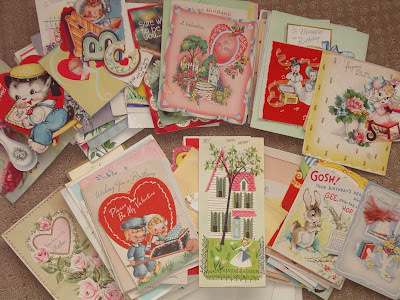 I wish I had kept cards from my childhood but they are long gone. 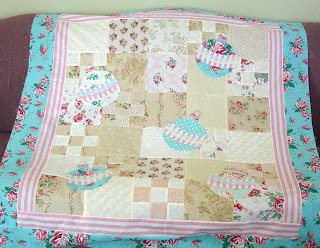 So I made some additions/changes to my bird quilt block. I unpicked the claws/feet because I really didn't like them. T gave me a really good suggestion for the claws, using triangles instead of lines for the feet. I will explore that further. I did put some triangles on the branch for feet but I don't think I got the shape of the triangle right. So I will think about that some more. I like the feet better not even there at all, at this point. What do you think? I added leaves tonight and I like them a lot. It makes it look more like a branch with birdies on it. And I added a 2nd row of black outline stitching to puff the bodies up a bit and extra to the wing. I like that. So its evolving. "In the leafy treetops the birds sing good morning. They're first to see the sun they must tell everyone. In the leafy treetops the birds sing good morning. " 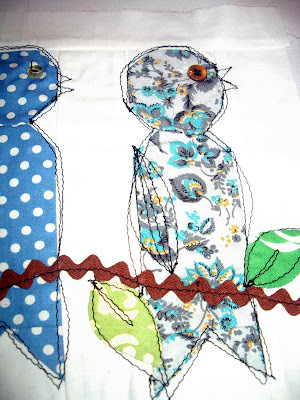 I have been enjoying the bird themed fabric and appliqué I've seen in the fabric stores and in blogs lately. I think the birds are so happy and cute. I've been wanting to design my own bird quilt and I've been making sketches over the past weeks but nothing seems just right. The other day I went through my feed sack squares to sort and organize them in prep for a special place in my new sewing room. 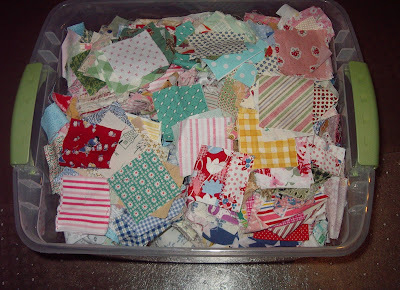 I came across this tiny inspiration feed sack scrap that I've been hoarding and admiring for years. I've also been appreciative of stylized sketchy outline work like Janet Claire does and the cute purse in my Japanese sewing magazine (purchased at from Kitty-Craft). I combined the two ideas and came up with a trial sample for a new quilt. I'm not sure if I'm quite "there" yet so I'll have to think about it and maybe play more with the idea. 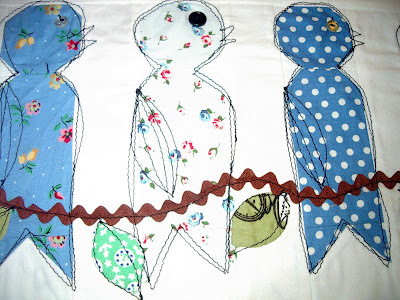 I know the birds look quite skinny but I'm going for a different look that some of the plumper appliqué birds. 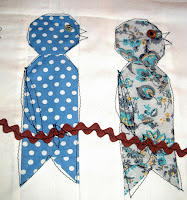 I love squares and simple lines and I want my birds to be more like the fabric. The bird is meant to be sitting semi-profile on a tree branch. I guess if I have to explain what its supposed to be I have more work to do. I think I may have to move the feet (claws?) a bit. Maybe. But the pointy bottom is supposed to be tail feathers. I think I'm in the right direction but I'm wanting to play around with it some more. And thats the most fun part! Upon seeing my red riding hood cape, my sister Chelsey exclaimed, "but I'M red riding hood!" "I want a red riding hood cape!" 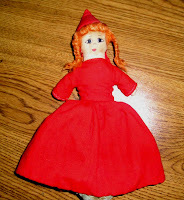 When we were little my grandmother (Freda, of course) made a little doll as a visual aid to tell the story of Red Riding hood. When you flip Red Riding Hood's skirt, her grandmother is revealed, and flipping grandmother's cap reveals the big bad wolf. Chelsey used to love to sit on my grandmother's lap and make her tell the story over and over again. Chelsey requested that her cape be made a very bright red, and that it be somewhat more diminutive in length than mine, and also that the hood be large enough to hide her head in. I made my own changes to the design of her cape. To make it wearable year round, and machine washable, I used mercerized cotton. Since it was so short, I decided to add visual interest by making a simple lacy button band that extended into the hood. 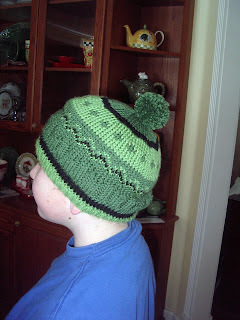 I couldn't help but admire this this pattern from Elizabeth when I saw it on several blogs but I was too busy before before Christmas to even consider getting it done. So during the holidays I kept thinking about how pretty it was and how great the fabric was that she used. I decided even if Christmas was over it was ok to start a project for next year. And, afterall, the fabric is so NOT Christmasy. So I went ahead and ordered the pattern from Elizabeth and the fabric from the Fat Quarter Shop. I augmented it with a few odds and ends I had in stash and began working on it this week. 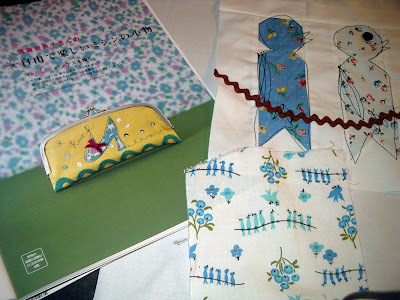 I should be folding fabric and working on my new sewing room right now, but I really wanted to start on a new project. Santa sent me a bulletin board from the container store for my new sewing room. I covered it in a piece from a vintage table cloth (I used duct tape to attach it because I might want to change the fabric on the board sometimes, but it didn't stick very well, so I'm still working on that). I have some covered button thumb tacks and vintage story book magnets to hold things on the bulletin board. The board is really great. It is both magnetic and perforated for thumb tacks and magnets and things hold well with the fabric around the board.